Can I swim, shower and workout with my sunless tan? Of course! But be sure to wait at least 4 hours to allow the formula to react with your skin's amino acids and proteins. In fact, the longer you allow the solution to remain on your skin, the longer lasting your tan will be. Swimming in highly chlorinated water will significantly reduce your results. We offer two different types of bronzing solution: clear or instant. Clear slowly developes on just your skin over a 4 hour period. Instant solution will appear instantly but does have a tendency to rub off. Clear is our most popular solution. 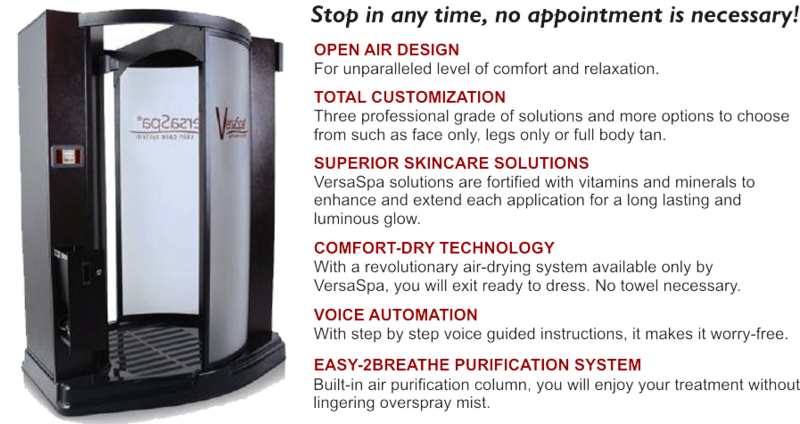 The VersaSpa Sunless Bronzing formula is completely water soluble. Users may notice some initial cosmetic color on the inside of their clothing while using our instant solution, but this color will wash right out.